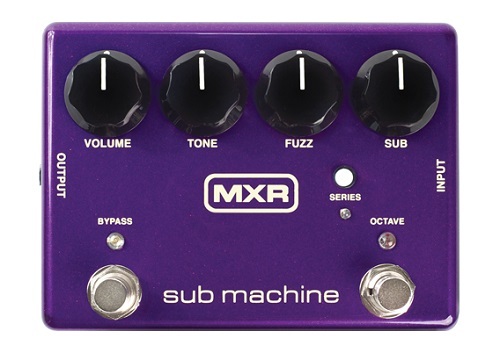 The MXR Sub Machine Fuzz kicks open the door to epic and unbridled sonic exploration. This mean little box combines the shaggy vintage tones of the La Machine Fuzz with a growling sub octave circuit, giving you a one way ticket to the sonic frontiers of heavy. The Sub Machine Fuzz features the La Machine Fuzz’s circuitry and all of its functions—from its Volume, Tone, and Fuzz controls to its electrifying octave up mode.—but it’s also got an old school sub octave circuit with its own level control, so you can dial in just the right mix of fuzz and sub octave signals. To further broaden the Sub Machine Fuzz’s thunderous tonal palette, the MXR team added a Series switch so you can run the sub octave signal straight into the fuzz—for some seriously subterranean saturation—or alongside the fuzz for a split channel effect.